GPS - Eagle Creek Fall's, 120m el. 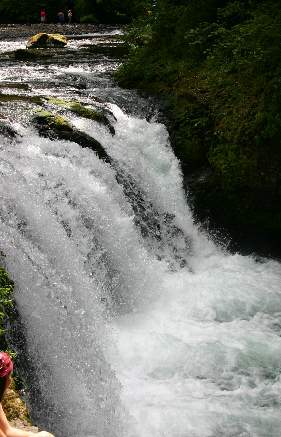 Eagle Creek Waterfalls are east of Portland. East on I-84 from Portland: take Eagle Creek exit 41. West on I-84 from Hood River: take exit 40 and head back east to 41. There are restrooms and picnic areas. Drive up along the creek to the road's end. Observe the No Parking Signs in various places. At the 2 mile point a side trail will lead to the Lower Punchbowl Trail. 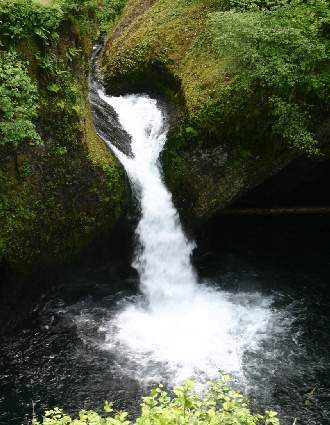 an overhead view of Punchbowl Falls in about one tenth mile. Punchbowl Falls can also be seen past Lower Punchbowl by walking up the rocky bank.